Ensure delivery and reduce your postage costs. Direct mail relies on USPS rules and requirements for proper automated mailing and delivery. Layouts that don’t comply run the risk of limited deliverability and higher postage costs. Questions on Postal Layouts? Call 800-959-8365. Download our FREE Postal Guide, or ask for Help. This updated postal guide follows current USPS regulations for all our mailing sizes and formats. When you print with us, we’ll check to ensure USPS guidelines are met. This short video will help you prepare a layout that ensures delivery and saves you money on postage. Follow these guidelines to correctly prepare folded self-mailers. 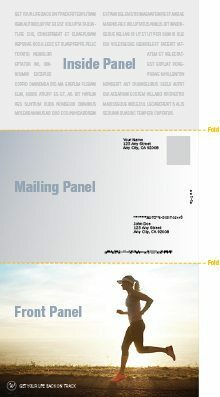 When mailing a folded product, the fold must always be at the bottom of the mailing panel. 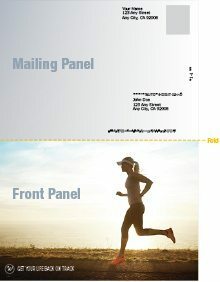 For tri-folds, the mailing information must be on the middle panel, with the OPEN edge at the top. Contact us for details on how to save on postage costs with a layout that complies with USPS automation.